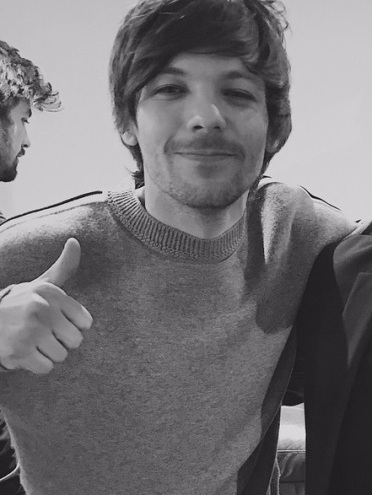 Louis Tomlinson posted several shots from the studio today as he continues to work on his debut album. The pictures, which show Louis holding a guitar in one and a microphone in the other, were taken yesterday. L.A. Producer Brian Phillips posted on of the pictures as an Instagram story saying, “Pretty wild writing with @louist91 @samhollander @timpagnotta yesterday”. Louis recently tweeted that he was “Back in the studio today to vocal something I wrote a few months ago.” Louis has a performance scheduled for Free Radio Hits Live on May 4. He’s likely to perform his latest single, Two Of Us, as well as a few other songs. Louis Tomlinson has been nominated for Top Social Artist for the Billboard Music Awards 2019. The BBMAs will be broadcast live from the MGM Grand Garden Arena in Las Vegas on May 1. Details on how to vote will be released soon. LTHQ tweeted how proud they were of Louis, saying, “ Team Tommo! Our lad has been nominated for a Billboard Music Award and it’s all down to you! Very proud HQ over here”. We’ll let you know how to vote for Louis as soon as details are available. Louis Tomlinson in House of Solo: "My Favorite Memories Are From One Direction"
On Louis’ time performing with One Direction: I loved the show and it’s given me great experience, but there are just so many times we had as a band that I look back on so fondly. We did an amazing gig at Madison Square Garden where all our family came, and that was really special. As a big football fan, playing Wembley was unbelievable and honestly so exciting. But definitely my favorite memories are from One Direction. On writing as a solo artist: By the time Liam and I really got into writing, we knew exactly who we were as a band so we didn’t really have to go through that experimental writing stage. So, I think the challenge as a solo artist has been keeping up the motivation as I’m trying different thing, and keeping the confidence that eventually I’m going to find it. On development and management of artists: On a personal level I am really interested in development. I started a record label and obviously I did a lot of development working on The XFactor. So having my own management company one day sounds excitinh to me; I like the idea of developing artists and helping them progress from A to B. On his favorite song this past year: One of my favorite songs this year was Tom Walker’s “Leave A Light On”. I like lyric-driven songs. I feel like there are a lot of cool-sounding dark productions out there but I do still like a good strong lyric. On the songs on the album: Most of the songs are quite autobiographical to be honest. Some are a little bit more subjective and open-ended. I feel like I have been making songs forever now, but when I set out to make this album I wanted to make it chronological, so the fans could go through my journey of the last two years with me. On what fans can expect from the album: The fans already know a lot about me, but I think they will learn to know me better through this album. You can order a copy of the magazine here. House of Solo posted on their Instagram that the Fashion issue comes out Friday. The magazine is ready and is being shipped out to people who preordered first before it appears in stores. Louis Tomlinson appears on the cover of the Fashion issue and is featured inside as well. House of Solo sold out of pre-orders multiple times, but you can still pre-order a copy here (delivery time 2-3 weeks). Louis Tomlinson was scheduled to perform tonight at Comic Relief. He has cancelled his performance at the show due to the passing of his sister, Fizzy, so he can be with family at this time. He was due to play Two Of Us live as one of the headline performers on the BBC1 charity show. We’ve made a post with things you can do to support Louis at this time. Louis Tomlinson debuted at #8 on Official Trending Charts Top 20 and #43 on Billboard Digital Song Sales based on only one day of tracking. The chart week runs from Friday to Thursday and Two Of Us released on a Thursday, which is why the numbers are based on only one day’s worth. Two Of Us has 4.4 million+ streams on Spotify and 3.2 million views on YouTube for the lyric video. A new song called Secret Heart has been registered to Louis Tomlinson on GEMA. There’s no more details known about the song at this time, but it could be another song for the album. Louis’ single, Two Of Us, came out yesterday. You can buy or listen to it here.